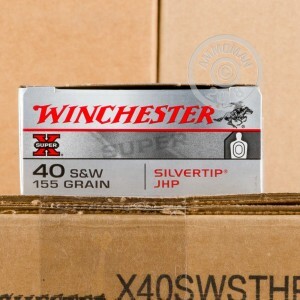 These .40 S&W cartridges from Winchester fire the proven Silvertip hollow point bullet and work well as a concealed carry load. 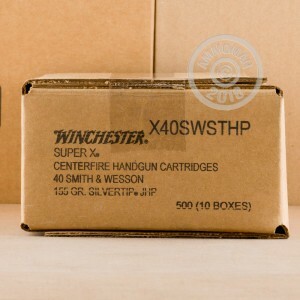 Each round in this box of 50 fires a 155 grain bullet at a muzzle velocity of 1,205 feet per second. The use of a light bullet and a high velocity contribute to reliable expansion and mitigate the risk of over-penetration. 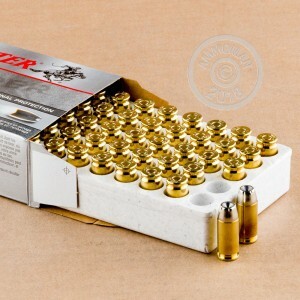 This ammo is loaded in Oxford, Mississippi and uses reloadable brass cases and non-corrosive Boxer primers. Score free shipping at AmmoMan.com with any order over $99!